Barracudacals Item No. BC72008 - Mosquito Stencils. 1 decal sheet 64mm X 50mm, an A5 sized stencil placement sheet all in a zip-lock bag. Much more extensive than the kit stencils; thinner carrier film than kit decals; may be used on any Mark. I don't think I have to say too much about Roy Sutherland's Barracudacals. Roy dwells amongst that rare breed that delivers near perfect decals. On the rare occasion that something gets past him, he corrects it pronto. 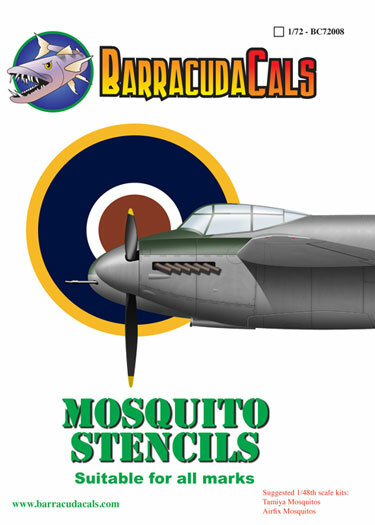 This 1/72 scale stencil set is designed for any mark of Mosquito but Roy specifically recommends the Tamiya and Hasagawa kits. These decals are a straight replacement of the kit stencils. That having been said, both Tamiya and Hasagawa are known for having rather thick carrier film so this set is ahead already. But wait. There's more. 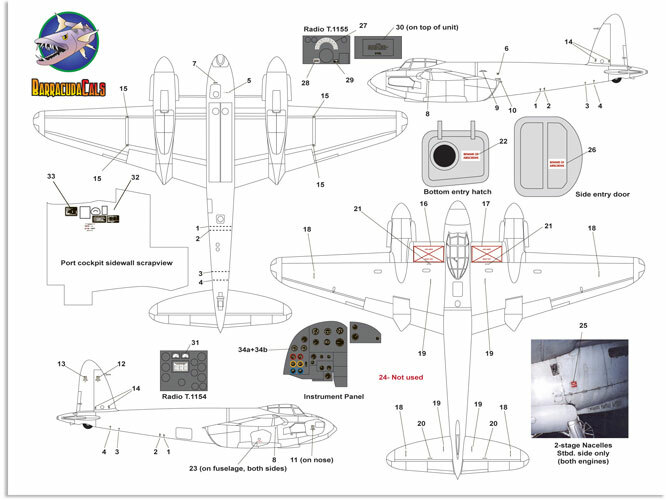 A much better instrument decal plus radio faces, side wall stencils and of course all of the exterior stencils and even some special markings for the two stage Merlin marks. There's nothing here that you wouldn't expect from the likes of Barracudacals. It will be interesting to see what Roy comes up with next.